If you enjoy games, puzzles, and having fun, you've come to the right place! "The Game of Boundless Rage and Rollicking Fun!" Have you ever been cut off in traffic? Has a neighbor’s trash blown into your yard? Have you been told that your dress DOES make you look fat? Now, with this high-energy party game, you can earn points by letting off steam with friends and family. After picking a card, you and your teammates will rant about it to the other teams while they try to guess the topic and score points. Exceptional ranting and superior guessing are the keys to winning Rant! Sound simple? But wait… you’ll need to make sure you don’t use specific key words during your ranting frenzy. It becomes more challenging to rave about those idiot drivers when you can’t use the words "drive" and "car". 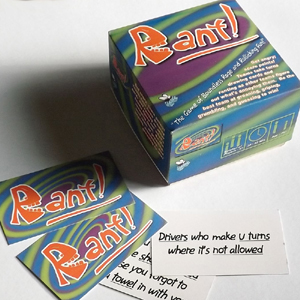 For even more spontaneous fun, try to complain using the limitations on one of six Rant Tactics cards, such as Rantomime, where you must express your irritation without using words. Ranting has never been so much fun! 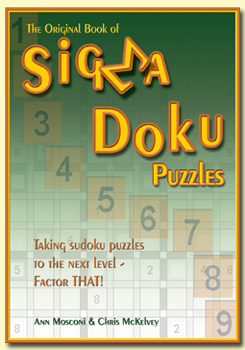 For a unique variation on the traditional sudoku puzzle, try out our newest logic puzzle book! Big Fly Games on Wired!! Wired Magazine's online blog called Decode now has an interview of Big Fly Games owner Ann Mosconi, along with a sample puzzle from our first book and its solution. Our new Black & White PrismaPixels are now appearing in newsletters across the country!! Now available on our order form: buy combinations of our books for a discount. Add colored pencils to your order for no additional shipping. Want to try before you buy? Click here for a puzzle walk-through! Our fans have been clamoring for a book of even bigger and more complex pixel puzzles than in the first two books! Over 50 full-color, original PrismaPixels puzzles, including some larger and more challenging than in the previous two books. Tetris Link by G. S. Schwartz & Co.
NOW AVAILABLE - How to solve a PrismaPixels puzzle in Spanish and Italian! APROVECHA AHORA!! - Como resolver un PrismaPixels en español! ORA DISPONIBILE - Come risolvere un PrismaPixels puzzle in Italiano! Pocket PrismaPixels; Colored Pixel Puzzles is now available for purchase. This book contains over 50 all-new pixel puzzles, including one each of three brand new (created by us) types of pixel puzzle. Colors range from two to seven per puzzle. Solve puzzles with pictures from nature, holidays, landmarks, people, and more, along with complete instructions, tips, and samples. This book is appropriate for ages 10 to 100!! Would you like to know more details about pixel puzzles and the book itself? Would you like to see a couple small sample puzzles with a few tips to get you started? If you don't see navigation buttons to the left of this area, click below to reset the page.